So for those that tuned in yesterday you know I started my wash day then. The Rusk shampoo and conditioner were used to pull off the first round of chlorine before I did my normal prepoo which this time included my Strong Roots. That doesn't seem like it should matter but my hair felt MUCH better this week having added it back to the routine. This other thing that didn't seem like it would matter also go corrected this week. Brief aside about that thing: some of you may remember I bought my first house when I got here and here are things you have to tend to as a home owner that don't matter in an apartment or a rental. Turns out we live in a state with ridiculously hard water. I know this because we have a water purification system and a water softener. I had been saying I need to tend to both and kept putting it off. In the mean time the water started to feel gross, the water pressure went off and my shower head was clogging up. Yeah turns out your resident blogger here forgot to add the needed salt pellets to the softener which was making all the water hard and clogging up my shower head. Three rounds of cleaning fixed the shower head and the water is both clear and not staining anything now. Yeah for being a little handy. Back to wash day: so after the aforementioned things were rectified my hair felt great today. It combed out super easy and didn't have that funky feeling on it the last few washes have. I can tell it's growing out but as I was less than polite to it the last few weeks I was careful to pay attention to my edges and ends. I deep conditioned about an hour with the Dr. Miracle's Deep Conditioner and then rinsed it all out. The rinse was almost enough to detangle everything then but it was too wet to style at that point. I t-shirt dried for a few hours before getting up to add my leave ins. I used everything from my now standard LOC process except I added a bit of water to my hair because it was very dry on the sides and bottom after being in a shirt for about three hours. I then opted for a different kind of roller set with the oversized metallic rollers that need the clips. I typically do the flexi sets but wasn't feeling the tight curls this week. Plus I should go through that tub of rollers more often. Several tweezers, another bonnet, and my missing tiny comb that I had been using as part of my three comb detangle was in that tub. I didn't have any kind of pattern to the rolling and mostly kept it the way my hair fell into natural parts from the comb out. The larger rollers got two clips and the smaller ones at the back just got one. I almost took a picture but when I did there didn't seem to be enough rollers so I had to add more and redivide the hair and by that time I was kinda done with the whole photo thing. The whole process made me feel very retro but will also let me do the straight hair without doing dumb girl things like putting heat on it two weeks in a row. I'll try to take a photo of it when I take it down. Since it's our spring break you will probably see me rambling a bit more this week. I have moderate hard water in my apartment and can definitely feel the difference in my hair when I forget to change the filter. Yay for being handy and fixing the water issues! I need to figure out where the filter is but I did get the salt back into the machine and things are so much better. This being homeowner handy is different. I also sent off for a kit to figure out just how hard the water is so I can set the machine to the right setting. I have hard water---but I'm too lazy to do anything about it. #dontjudgeme! I can't wait to see your straight hair! Yeah my hair didn't appreciate the fact that I was a lazy bum the last two days. That plus humidity made it a puff ball. I'm working on a short prepoo so I can co-wash and then I can take photos. Gosh, I have hard water too. I need to buy a new filter situation! It's good that you were able to get it straightened out, though. You make me want to break out my rollers, too! I might do that after my next wash. 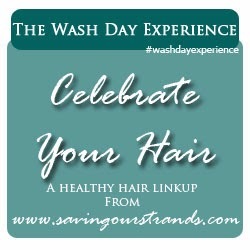 Enjoyed reading your wash day update! It was installed in the house before we bought it thankfully but I totally forgot to check on that thing. There was a tiny bit of salt that was hung up around the pipe but the water is clear and pretty again. I just need to find that stupid filter lol.